By buying this product you can collect up to 4788 bonuspoints. Vagnsset med 4 personvagnar typ DB, vagnarna har innerbelysning, totallängd över buffertar 101 cm, epok III. Passande ånglok hittas under 39034. Model: The cars have detailed construction. The coaches have train route signs. All of the cars have factory-installed LED interior lighting. The 2nd class skirted car has a factory-installed pickup shoe. The entire car consist can be supplied with current by means of the factory-installed current-conducting close couplers. A permanently defined car sequence is required to do this. Standard close couplers are used respectively at both ends of this express train car consist. Total length over the buffers 101 cm / 39-3/4'. Prototype: 4 different design German Federal Railroad (DB) express train passenger cars. Version for the train route D 182: Hannover Herford Hamm (Westph) Dortmund Essen Duisburg Düsseldorf Cologne. 1 type Büe express train passenger car, 2nd class. 1 type WR4ü39 'Schürzenwagen' / 'Skirted Car' express train dining car. 1 type ABüe 'Schürzenwagen' / 'Skirted Car' express train passenger car, 1st/2nd class. 1 type Büe 'Schürzenwagen' / 'Skirted Car' express train passenger car, 2nd class. The cars look as they did around 1966. 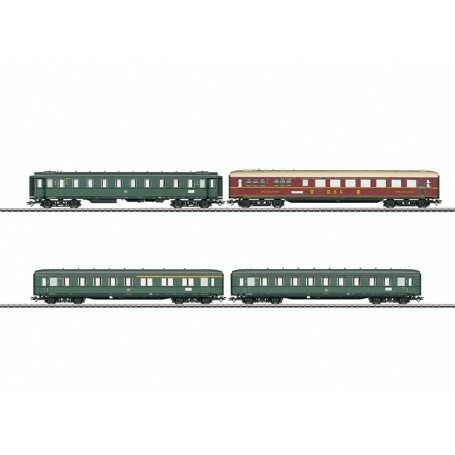 The class 18 505 express train steam locomotive to go with these cars can be found in the Märklin H0 assortment under item number 39034. One-time series. The right express train cars to go with the class 18 505 steam locomotive.Train route D 182: Hannover Herford Hamm (Westph) Dortmund Essen Duisburg Düsseldorf Cologne.